superdumb supervillain: Gama-Goo + giveaway! I love the light blue chicken tee! They have some totally cute stuff! On occasion, I like to be reminded of the good old days before I, uh, spawned. When I preferred vinyl to dead silence, mission-style burritos and beer to chicken nuggets and juice boxes, all-day thrifting marathons to zoo excursions. When I had a life of my own. Gama-Go lets me be the subversive mommy at playgroup, at least here in Wichita. Their Beatnik-manga-barfly aesthetic is effortlessly cool and always fun. Need a hostess gift? How about an ashtray with a giant Yeti eyeball or a throw pillow shaped like a ham? Oh, yeah, they've got your back. My one complaint about Gama-Goo is that the line only goes up to 18-24 month sizes. It is absolutely criminal that the Tigerlily Rock tee isn't available in a 4T for Roo. It would be so adorable on her. To enter and win a Gama-Goo tee or onesie of your choice (a $24 value! ), please comment on this post with your favorite item on Gama-Go.com. Entries will be accepted through March 26th and I'll pick the winner using Random.org. US readers only on this giveaway, sorry Canucks. Only one entry/comment per person, please. Love the Yeti Monster Truck Tee too. The Wieners Attack wallet is hilarious! Ohhh how true, what you say *cry* I swear I never even listen to my own music these days. I keep telling myself that someday my kids will be grown and I will return to my former self, but somehow I don't think I'll be hitting up my old hot spots ever again..alas. I doubt they'd seem nearly as cool now, let alone when I'm 45 lol. Anyhoo, my fave is the yeti monsyer truck tee, in kelly green(12-18mo). i really do love the tigerlily rock tee. awesome giveaway, thanks! I really like the Critter Ark Onesie! I LOVE the Critter Arc Onesie in pink - cute as a button! My daughter's almost a year, so you can guess what size I'd choose! Thank you SO much for the giveaway! I also love the Critter Ark onesie in Pink! 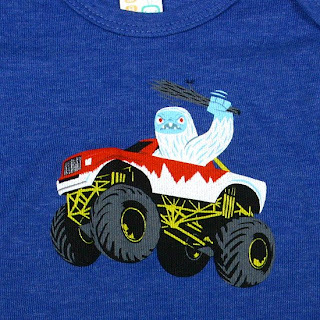 the yeti monster truck tee would be perfect for my monster truck loving 2 yr old. The chicken tee in pink would be adorable. I like the Boing Boing hoodie for women and lots of the other tees too! I saw the Yeti shirts when I was shopping in New York. They are so funny! I'd have to say my favorite is the Yeti Decoy mens shirt! The monster truck is pretty cute too! I love the chicken tee. 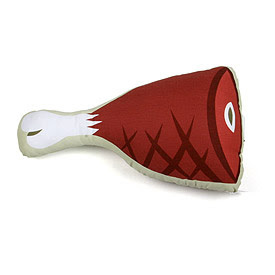 And the ham pillow! I LOVE the Yeti Monster Truck Tee! Adorable!! Loved the Yeti Monster Truck Tee for kids and for us bigger people I loved the Yeti Woodland and Deathbot Pyramids hoodies. Cool stuff! I love the chicken tee in pink! Adding your button to our blog...thanks for having ours! I'd choose the Yeti monster truck shirt in green size 18-24 months. So cute! Critter Ark is pretty cool! I love the Chicken or Critter Arc tee and onesies! Cute and funky designs! Love the Tigerlily Rock onesie. I love the Gama-Cats Button Set. My fave is the Tiger Rock Onesie. I love the light pink chicken tee. It looks super comfy and cute. 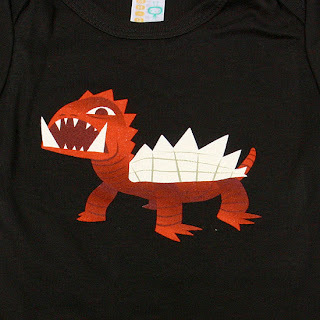 I love the Turtle Roar Tee - perfect for my son! I like the chicken T-shirt in pink. I love the ham pillow. So very clever. I love the turtle roar onesie, I'd love to have this for my boy coming in August!! I like the critter ark tee! The clothes on this site are so adorable. I love the critter ark onsie. Thank you for this giveaway and please enter me. Thanks. I love the Critter Ark Onesie in pink. So cute! I love the Critter Ark tee in green or brown...great stuff! My favorites are the critter ark and the chicken. How cute! I also love the Tigerlily Rocks Tee! How cute! i love the chicken onesie. The yeti monster truck is hysterical. You're in Wichita? I'M also in Wichita--Cool! 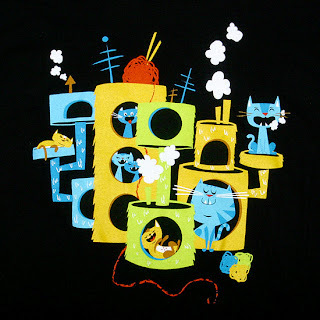 Love the Critter Ark Tee--very cute. I love the Turtle Roar Tee! Gotta love the Tigerlily Rocks t-shirt. Love it!! I love the critter ark tee!! My boys would look so cute in it! I like the Tigerlilly rocks Tee. From Gama-go: ninja-kitty tee - so cute! I love the critter ark tee in pink! I like the chicken tee in green! I would love to get the Turtle Roar Onesie in Black. Size 6-9 months. I don't know how to pick just one! I'd say with the obsession with all things dragon at our house, I'd have to go with Turtle Roar in size 3T. Oh I love the Tokyo women's tee! It's cute! the yeti monster truck tee please! the yeti monster truck tee is my pick. I'm with you- but onesie it for me! Tigerlily rock is awesome, and so ridiculously cute as a onesie. the Chicken onesie had me at hello. love it! What an unusual site. I absolutely love the Chicken Tee! I'd love to win the Chicken Tee in Kelly Green for my daughter. I love the tigerlily rock tee! in ANY color. too flipen' cute. The kids stuff is adorable, but I especially love the toxic critters shirt for me! The Chicken Tee is TOO Cute! the yetti monster is cute. I can't believe my baby thinks this is great but is afraid of clowns. The Tigerlily rock Tee is ohhh so cute! I'm with you...the Tigerlily Rock Tee in Chocolate is adorable! Favorite item is the Vibrant Birds tee. The tee shirt in size 18-24 mos. LOL- I LOVE the chicken onsie! So cute! 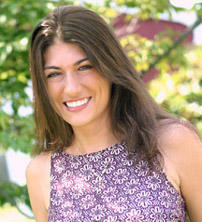 i'm new to their website, but i like the tigerlily rock tee in brown in 18-24 mos.-so fun! I like the Tigerlily Rock Tee. cute stuff! My kids would love the green chicken t-shirt in a 18-24 month! I really like the womens cloud nine hoodie and the critter ark tee. I would love to win the chicken tee in a size 18-24 months, how cute!!! I like the turtle roar tee. It would look cute on my little man. My fave product is the womens' boing boing hoodie. The Chicken Tee is so cute! Now these are classy and so cute! I love the turtle roar tee the best!! I like the Critter Ark tee. Thank you!! Yeti Monster Truck Onesie is really cute! I klike the Tigerlily Rock onsie. I like the Turtle Roat tshirts. turtle roar onesie is the best! How cool! I love the tiger lily rock tee in light blue. Critter Arc Onesie in pink is very cute! They are all so cute but we like the Critter Ark Onesie the best. Thank you for the nice giveaway. I like the womens' begging pup long sleeve tee. OMG, I love the Yeti Monster Truck Tee--soo cute! Oh boy these are so cute! I love the Women's Yeti Wobble Tee and the baby Chicken Tee. The critter ark tee is a must have! What a great site, and the shirts are super cute!! 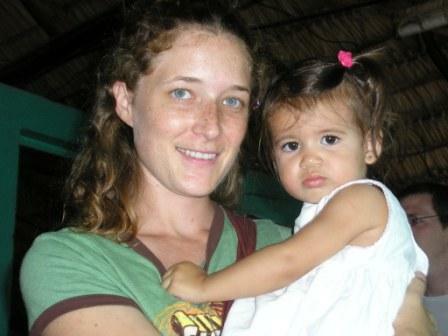 Before my pregnancy (and postpartum baby weight) I enjoyed wearing my three Gama-Go shirts. They are crazy cute and such fun. Now I can't wear them so much, but how cool would it be for my baby to wear one? Jasper looks CUTE in his! My fave is the brown Tigerlily Rock in 18-24 mos. Ooh la la, how cool is this!?! I like the Critter Ark onesie! The peacock t-shirt is calling to me and I like every one of the zip wallets. 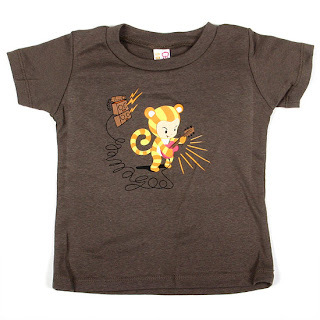 My choice would be the Tigerlily Rock Tee in Brown, size 12-18 months. Tough to pick just one thing...but I guess I would have to say the Tigerlily onesie. That would be so cute with a teeny-tiny pair of jeans! I love the Tigerlily Rocks in blue, 12 mos. for my little man. The Whoo Loves You Zip Wallet for ladies! I like the "Yeti Monster. I like the tigerlily tee. I love the chicken tee in green. It was so hard to choose my favorite! Thanks for the chance to win! I love the chicken tee in green or yeti monsyer truck tee, in green(12-18mo). 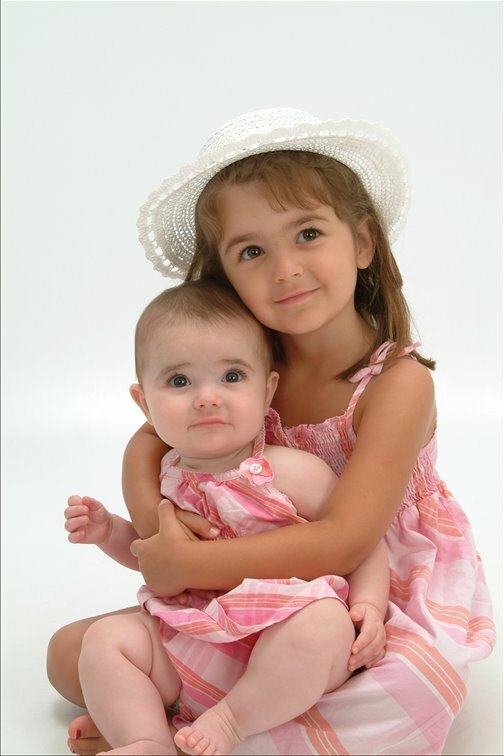 They are both so cute. Dirty Bird Boxer Briefs are too funny! The tigerlilly rock in chocolate is super cute! green Yeti Monster Truck Tee 18-24 mos. nice site! ty 4 the contest! I like the Tigerlily Rock Tee. Yeti Monster Truck Onesie Green Size 12-18 months. Thanks! I LOVE the Tigerlily Rock onesie in chocolate, though it's hard to choose between that and the chickens. I love the chicken tee! Love the Tigerlily Rock Onesies & tees!